We based this off of the success of the Nasturtium Flip, but pulled in an old friend we hadn’t played with since last summer: Rain Honey Mano Melon Vodka! 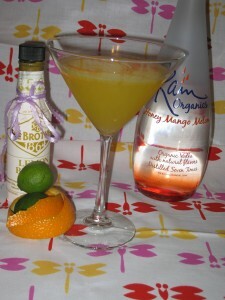 Added to this-fresh squeezed orange/key lime/lemon juice, simple syrup and a few dashes of Fee Bros. 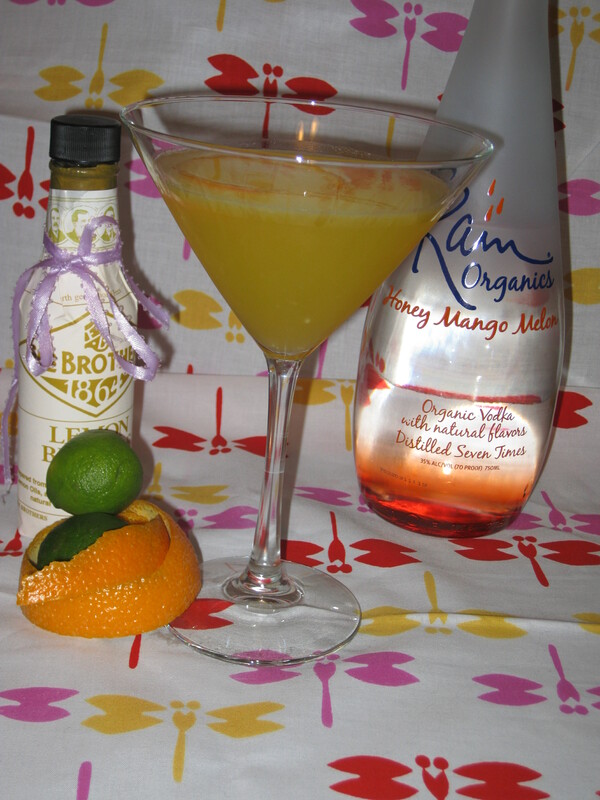 Lemon Bitters…….mmmmm, happy summery citrusy goodness in the glass! We skipped the flip (egg white) this time and just let the fresh flavors shine through. Delicious! 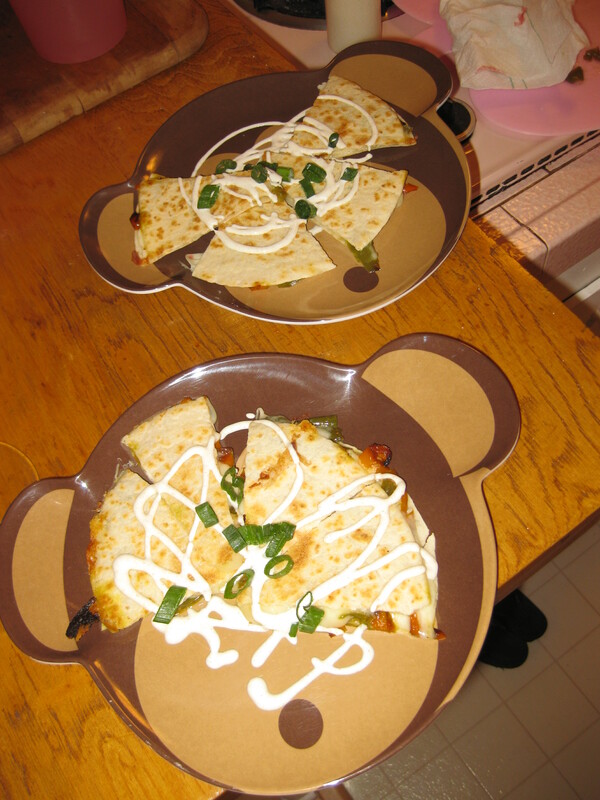 We also enjoyed some fresh home made salsa, chips and roasted pepper quesadillas with lime cumin cream. Can you see us smile from where you are? Not a bad way to end a workday. We based it off of this recipe, but substituted Godiva Chocolate Liquor for the white chocolate liquor and used Stoli Vanilla (which we had on hand) instead of Grey Goose Vanilla Vodka. In the interest of full disclosure, I did not expect to enjoy this one (Shaker One here). Color me oh so happy to be wrong. Wow. Creamy, chocolate-y, fantastic. The star here is clearly the Godiva chocolate liquor. It would simply not be as good with a lesser chocolate booze. And as you can see, we had some fun with the cream~ coloring it w/ get food color to create the “egg” effect. 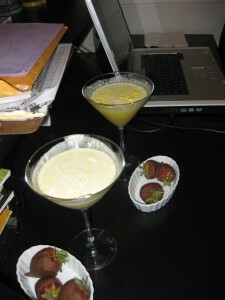 After the photo op, we whisked the cream into the drink. Wow again. The more cream the better here..thicken it slightly and throw in about a tablespoon of powdered sugar. You could have a lot of fun here with chocolate egg/bunny/peep garnishes. If you’re not trying to make it pretty, go ahead and shake the cream up in the shaker and strain into the glass. 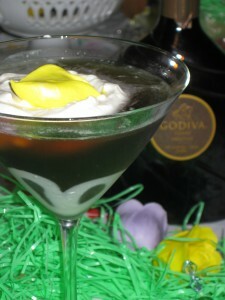 A wonderful dessert martini for the chocolate fan…. you probably won’t want more than one…very rich. Of course, we have to get our fruit and veggies in there, so we served it with chocolate covered strawberries. Mmmmm,a balanced diet! And so we close a short school night shake with satisfied smiles. Until next time~happy drinking!